Aryadeva (‘Phags-pa’i lha) was born in Sri Lanka to a royal family, and lived between the middle of the 2nd and the middle of the 3rd centuries C.E. According to some accounts, he was born from a lotus. At an early age, he became a monk and studied the Buddhist scriptures, the Tripitaka, thoroughly there before leaving to South India to study with Nagarjuna in the Shatavahana kingdom of King Udayibhadra. King Udayibhadra was the recipient of Nagarjuna’s Letter to a Friend and The Precious Garland. Aryadeva accompanied Nagarjuna and continued to study with him at Shri Parvata, the holy mountains overlooking modern-day Nagarjunakonda Valley in Andhra Pradesh, within the Shatavahana kingdom. At that time, Matrcheta, a devotee of Shiva, was defeating everyone at Nalanda in debate. Aryadeva went to meet the challenge. On the way, he met an old woman who was trying to accomplish special powers and, for that purpose, needed the eye of a learned monk. Moved by compassion, he gave her one of his eyes, but when she took it, she simply smashed it with a rock. After that, Aryadeva became well-known as having only one eye. Aryadeva went on to defeat Matrcheta in both debate and special powers and, after that, Matrcheta became his disciple. Aryadeva stayed at Nalanda for many years. Later in life, however, he returned to Nagarjuna, who entrusted all his teachings to him before he passed away. Aryadeva built many monasteries in that area of South India and taught extensively, establishing the Mahayana tradition and, in particular, the Madhyamaka tenets with his text, Four Hundred Verse Treatise on the Actions of a Bodhisattva’s Yoga (Byang-chub sems-dpa’i rnal-‘byor spyod-pa bzhi-brgya-pa’i bstan-bcos kyi tshig-le’ur byas-pa, Skt. 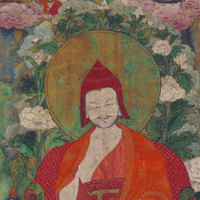 Bodhisattvayogacarya-catuhshataka-shastra-karika). It is known as The Four Hundred or Four Hundred Verse Treatise for short. Like Nagarjuna, Aryadeva too wrote commentaries on the Guhyasamaja Tantra.